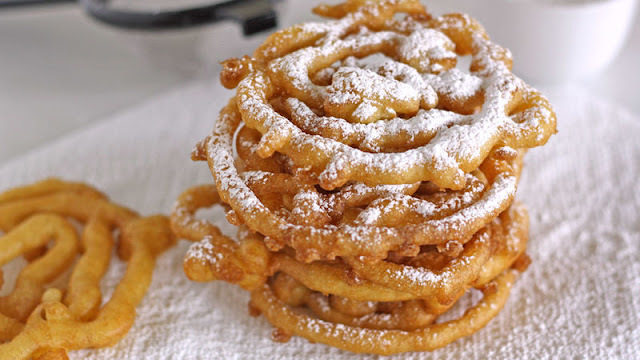 Easy Funnel Cake Recipe- Hello everybody, welcome back with ZetiraKitchen! Today I will share about Easy Funnel Cake Recipe. Funnel cakes are made by swirling batter into hot oil in a circle pattern and deep frying until golden-brown. The batter is was poured through a funnel and make a pattern like a funnel cake. Funnel cakes are served plain with powdered sugar, but you can create with jam/jelly, cinnamon, chocolate, fresh fruit, or other delicious toppings. Heat oil to 375 degrees F on frying pan. Put milk and egg in large bow then beat together. Add flour, baking powder, cinnamon and salt. Stir until smooth. Cap the funnel hole with one finger. Pour the batter in funnel. Open the hole center then swir around until like funnel cake pattern. Flip cake until the colour golden brown.